When it comes to historic buildings it is always pleasing to see additions and alterations made that are sympathetic with the original design, but still distinctively different. 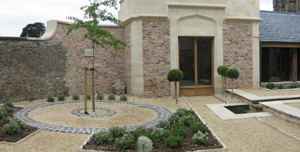 This project is the Mary Mitchell Garden created 2008 or 2009, adjacent to Wells Cathedral, Somerset, UK. It's a design that is adjacent to the new tourist shop with an appropriate combination of the old and the new. 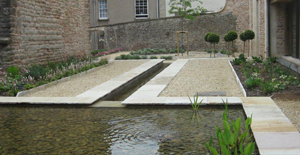 So we have tried to put it all in context with photographs of not only the Rill and Garden but also the Cathedral and its surrounds, the Rill as a water feature is really sympathetic treatment.